Obama-hatred looks a lot like JFK-hatred. Now can we hear some more from Halperin, Broder & Co. about how the hatred of Obama is actually Obama’s fault? Â This is just how Birchers behave. Â All that’s new is the takeover of Â the GOP by the John Birch wing. I was in kindergarten in Dallas when this poster appeared. It isn't just an artifact of some remote, bizarre past. 25-30% of Americans – & more among hardshell anti-Obama paranoiacs – are grey enough to have a living memory of it. In no few cases, the Obama haters aren't just the Kennedy haters' heirs & co-thinkers, but the same dismal people. 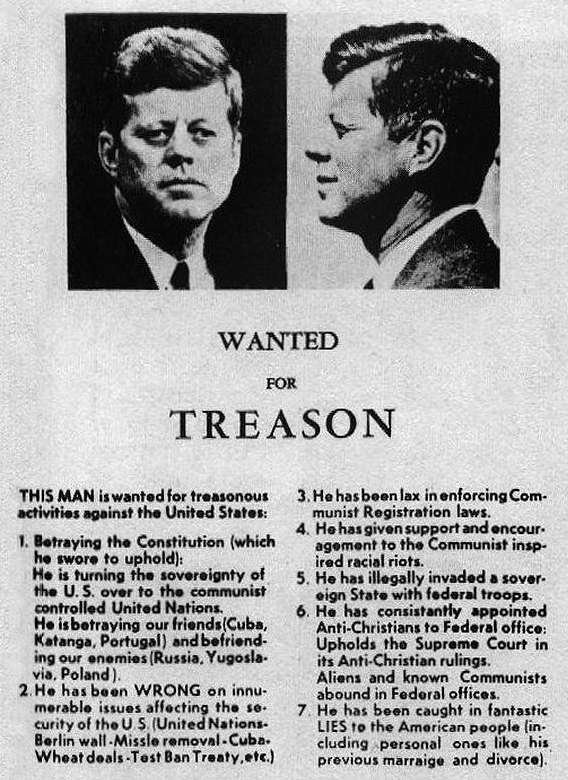 Between 1963 & 2008, they never really abandoned treason rhetoric. If you google 'Kennedy + traitor,' you find mostly slander not of John Kennedy, but of his brother Ted. Note the counts of the 'indictment' that point, explicitly or implicitly, to race. They hated Kennedy esp. as a race traitor.